Three teachers are scheduled to embark on a unique mission June 14. They are among the newest class of 11 astronauts recruited by NASA, who will begin training this summer for a future trip into space. The trio of educators intend to use their experience with the nation's space program to extend the boundaries of the traditional classroom to the cosmos and beyond. The teachers were selected from a field of more than 1,000 applicants and will live, work, and train with a corps of more than 100 astronauts at the Johnson Space Center in Houston. If all goes according to plan, the teachers and the others in the astronaut Class of 2004 could be scheduled for a space flight by 2009. No teacher has flown into space since Christa McAuliffe, who died in the 1986 Challenger explosion. The teacher who served as McAuliffe's alternate on that flight, Barbara Morgan, has been training in Houston since 1998 and is scheduled for a space flight in 2006. "These are the astronauts who will lead us through the next steps in the new exploration vision," said NASA Administrator Sean O'Keefe. "The class is made up of pilots and engineers who will help us develop the next-generation vehicle, scientists who will do research to help humans live and travel in space, and three new 'educator astronauts' to help ensure that a new generation is ready for the challenges of [space science] exploration." Despite the possibility of a protracted wait for the opportunity to join a flight, the new astronauts, who were introduced May 6 at the Smithsonian Institution's Air and Space Museum annex in Chantilly, Va., said the chance was one they couldn't pass up. "I'm standing in the right line, at least," said Richard Arnold of Berlin, Md., who most recently had been teaching at the American International School in Bucharest. Dorothy Metcalf-Lindenburger, 28, of Vancouver, Wash., first learned of NASA's Educator Astronaut Program (EAP) as she searched the internet seeking an answer to a student's question: "How do you go to the bathroom in space?" "Today I say goodbye to one chapter of my life and start another," the teacher of five years said earlier this month during a school assembly attended by about 2,000 people, including Washington State Superintendent of Public Instruction Terry Bergeson. Metcalf-Lindenburger said she has enjoyed her job teaching science at Hudson's Bay High School, but is "looking forward to teaching in a different way" through EAP. The program was developed by NASA to recruit K-12 teachers with the experience and expertise necessary to engage in space travel. During training and upon their return, educator astronauts are charged with helping the agency develop new ways to connect space exploration with the classroom and to inspire the next generation of scientists and explorers. 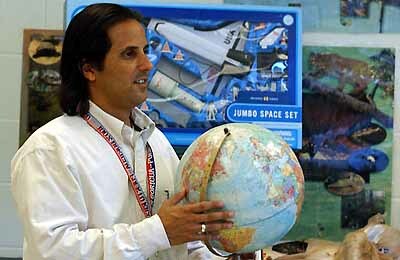 "When I saw the announcement, I felt that everything I had done to this point was in preparation for this job," said the third educator-astronaut candidate, Joe Acaba. A journeyman and former Marine reservist, Acaba worked as a Peace Corps volunteer and as a hydrogeologist for an environmental consulting firm in Los Angeles before settling in Florida, where he taught ninth and 10th graders at Melbourne High School in Brevard County. Acaba later moved to Dunnellon Middle School to teach seventh-grade math. After being at the job for a year, he and another teacher started a Science Center at the school for students interested in science and hands-on research. His co-teacher conducted a field research class, and Acaba taught the classroom portion of the science curriculum. The introduction of the 11 new astronauts comes as the nation's space program is in flux, with shuttle missions grounded until at least 2005 in the wake of last year's Columbia explosion and amid plans to permanently ground the shuttles in 2010 to redirect efforts for a return to the moon by 2020. Immediately after the Columbia tragedy, NASA said it remained committed to recruiting teachers for future missions. Designed to pique students' interest in science and math, the program was expected to use satellite video feeds and the internet to connect students on earth with teachers in space to explain the intricacies of space exploration. But the number of astronauts waiting for their chance at space has called into question whether these latest recruits will ever get their shot at the stars. Last year, when the astronaut corps swelled to 144, the agency's inspector general warned that too many astronauts were waiting around for their chance to fly and that the agency was overly optimistic in its prediction of the number of future shuttle flights. If things go well and astronauts indeed return to the moon by 2020, the astronauts in the current class could at that time be among the most senior members of the astronaut corps, NASA spokeswoman Melissa Mathews said. When Columbia disintegrated last year, Arnold was in the process of submitting his application, which he knew would be one of many hundreds, so the possibility of truly being an astronaut seemed remote at the time. Still, he said he discussed the dangers with his wife and decided the risks were worth the reward. "I've always encouraged my students to follow their dreams," he said. "I hope I'm setting the same example for my kids." The new group of 11 is the smallest class of astronauts since the shuttle program began. They join a corps of about 100, officials said, which has dropped significantly in size in the last year through retirements and attrition. Mathews said the new astronaut class takes the inspector general's finding into account and provides a new mix of skills and specialties to round out the corps.